I woke up this morning and decided I wanted to change the look of this site, and accomplished the change in about 20 minutes, 13 of which were spent modifying my logo into a header format. Before you think I am something that I am not, the credit should go to the theme I am using, not my abilities. I originally launched with one blog that was to house my photography projects and posts, as well as my other ramblings about life, WordPress, all things Apple, etc. I quickly came to realize that it was just too much for one site to hold and was at odds with the clean ease of use and user experience I desired. Being quite busy at the time, I made an executive decision to clone my existing installation, and just change-up the content. That worked in the short-term, but left me knowing that it would need to be remedied at some point, soon. Normally site migration is not a trivial task. I just completed a site migration for my wife’s site, the Simply Inspired Home, from a “Premium” WordPress theme to its new home running on the Genesis Framework. Before I go any further, let me be very clear about my so-called abilities with WordPress. My first look at WordPress was December of last year (2010) when I created version 1.0 of the previously mentioned Simply Inspired Home. In March of this year (2011) I launched my own sites (darrylbueckert.com and dbueckertphoto.com), this time on the Genesis Framework. Prior to the first site I had no experience or knowledge of web hosting, html, css, php, or any other web related acronym you could throw out there. In fact I was quite intimidated by it all. Only with the benefit of hindsight can I realize how silly those fears were. There is a lot to learn, by no means have I even scratched the surface, but you can learn in layers. Peel another layer of the onion when you are ready for more, or in my case, when your day-to-day reality forces you to learn more. So what happened between December and March? In the first go around we were looking for themes that looked nice, with little to no regard for function or expandability. Developing your own content and site is not an event, but a process. After two months I came to realize that the theme we had chosen just wasn’t capable of keeping up with the ever evolving content and plan for the site. Perhaps that is a bit harsh, really I wasn’t capable enough with php or css to make that theme do what we needed. So I started to research, the kind of work that I should have done the first time, to learn more about WordPress and the different themes available for it. After sorting through an overwhelming amount of data, a pattern or hierarchy started to emerge. There are basic themes and free themes, you typically get what you pay for. There are paid themes that offer a bit better coding and functionality (and support), and then there are elite theme developers and theme frameworks. In an upcoming post I am going to review the top theme developers and frameworks. One of my WordPress hero’s, TentBlogger, wrote an amazing post for Smashing Magazine detailing the support networks of the major theme developers. After all that research it became very clear that these premium developers really did make a vastly superior product. 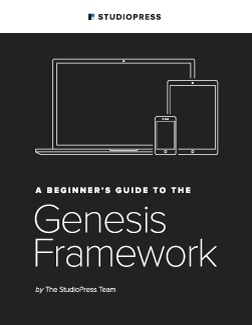 So in March when I launched my own sites, I did so on the Genesis Framework. I chose it for a few key reasons that I have detailed below. I have seen each of the claims made by the product features come true or be validated in my experience. Claim: Code written for best possible SEO results. Claim: Written with the best possible security in mind. Experience: Hard to classify this one. It tests very well with any kind of security audit I have done, and there have been no site intrusions, but I doubt anyone that skilled would be looking this way anyhow. I will have to take the experts word on this one. Claim: Easily change the look and function of your site by changing the child theme. Experience: Well this is the purpose of this post, isn’t it? Changing this site from one Child Theme to another took only a matter of minutes. More detailed sites may take a bit longer, but is still easy enough to carry out. Moving my wife’s site took many (MANY) hours of planning and preparation, but only took a few hours to actually do. Truthfully most of the time was spent reformatting post content, not any kind of backend changes. It took me longer to write this post, than it did to change the look of the site. Each moment and each blog I spend time with (now that they are all on Genesis) only further adds to my understanding of how to get it to do what I want. I also learn more about what it is truly capable of, which has a direct effect on what I want/expect out of a site. If it sounds like I am a Raving Fan, it is because I am. Not only do I use it for almost all of my sites (I have a few more I didn’t mention here), I urge all my friends/acquaintances to use it, especially if they plan to ask me for help. How about you, are you happy with your WordPress theme? You may want to give Genesis a try. Thanks for the heads up, Rosa. It’s all fixed. (I left the html code in the link url, oops!). Thanks for the great review, Darryl – I’m glad you’re finding it so easy to use! Not sure if easy is the best word. With all of the SEO and hooks and all that I am instantly aware of how much I don’t know, yet. That said I can get a result that I like without knowing all that stuff.